Half-paralysed British fundraiser Claire Lomas made an honorary fellow by Israel’s leading university after completing London Marathon using its bionic innovation. Article by Jenny Frazer, published on Jewish News – Times of Israel on December 31, 2018. The British charity fundraiser, Claire Lomas, has been made an honorary Fellow by Israel’s Technion as a result of her pioneering use of the ReWalk body suit. Ms Lomas, a former equestrian event rider, had a riding accident in 2007 which left her with severe spinal injuries. 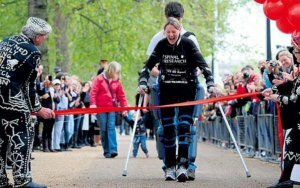 In 2012 she became the first UK user of the ReWalk suit, completing the London Marathon in 17 days wearing the device. It was invented by a Technion graduate, Dr Amit Goffer, and was processed through the university’s Technion incubator for further development before it was used in clinical trials. It is a bionic walking assistance system, which uses powered leg attachments to enable partially paralysed users to stand and walk upright. Dr Goffer invented the device because he himself had become quadriplegic after a life-changing accident, and although he was not able to use the ReWalk himself it became a world-wide success in helping paraplegic cases. Each year Technion awards six honorary fellowships to international public figures who have made outstanding contributions in the field of science and technology. Ms Lomas, who lives in Leicestershire, was nominated by Alan Aziz, now chief executive of Technion UK, who took her to Israel to meet the developers of the ReWalk in 2014.